In my POC environment, I designed and implemented the docker infrastructure that is displayed as above. It combines two major parts: private docker registry host and docker host. Step 1) The private docker registry host pulls the docker images from the public registry. Step 2) Build SOE docker images based on the pulled images. Step 3) Push the SOE images that are generated in above to the private registry. docker use http PUT method to upload the filem which older squid version (e.g 2.6) does not support. The private registry should be same as the tag that is used in step 2. Step 4) On the docker-host, pull the SOE images from the private docker registry host. 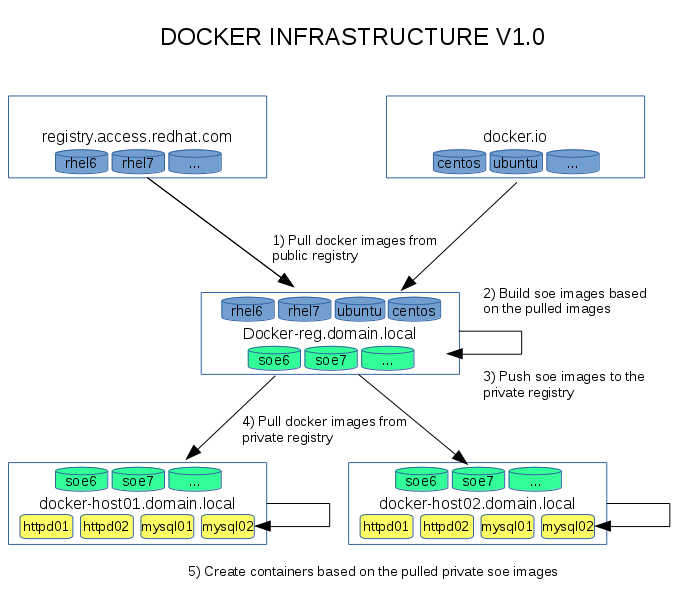 Step 5) On the docker-host, create containers based on the SOE images. I have puppetized steps 1-4, and it works so well!! Once I published it to github, I will add a link here. The things that I am working on now is to puppetizing step 5, and adding monitoring functions.